I was swept away from the moment I began reading Dreamwielder to the turning of the last page. I love reading sci-fi, but for some reason I don't pick one up as often as I do a romance. I am so glad I clicked on Dreamwielder, because from the cover you don't automatically think sci-fi. I'm used to mythical creatures on the covers. The journey begins with Makarria, a young girl of twelve, with a vast untapped power to dream and what she dreams, can become reality. For years her parents and grandfather have attempted to keep her powers hidden, but as she reaches maturity the power seems to grow more and more out of control. What Makarria doesn't know, what she hasn't been told, is that the Emporer and his sorceror, Wulfram, have been systematically killing all those with the potential for power, especially females. Wulfram is able to "sniff" out the use of great power with scent-hounds, women who were merged with large compasses, the spike of the compass protruding through their stomachs, so that the women can turn toward the direction they "scented" a magic user. And one night, they catch scent of Makarria. Knowing that time is of the essence, Parmo (Makarria's grandfather) absconds with her in the middle of the night in hopes of eluding Emporer Guderian and Wulfram. So begins the tale of Makarria. On her journey she will cross paths with others who are searching for the prophesied child of royal blood. Some to protect her, and others to exploit her powers to gain control of the empire. I think what I like about most sci-fi books is how the story is told through multiple voices, rather than just the hero/heroine of romance novels. A sign of a good book to me is one where the author is able to juggle all those voices, story lines, action and world building without confusing me, the reader. Its so annoying to have to constantly flip back to previous chapters to recall who a character is or where they came from, why are they there in the book?! Mr. Calcaterra pulls this off wonderfully, no back flipping in this one. The only thing I have to say that's negative about the book, and its small, is that the pace seems to stumble just before the climax of the story begins, that lull before the storm. Other than that, I really enjoyed this book, and will probably read it again...yes, I am one of those readers who can read a book multiple times and still sigh when I finish it...for the 5th time. Four stars, 0 flames for Dreamwielder, by Garrett Calcaterra. 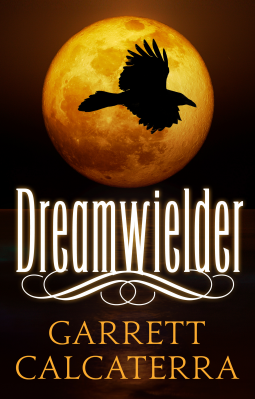 On a side note, I wasn't able to find this title on Amazon but you can find it here: https://ganxy.com/i/74538/garrett-calcaterra/dreamwielder and also on iTunes.